Flash Photography: is it safe to use flash when photographing my dog? It is safe to use a flash when photographing a dog. The vast majority of dogs are not reactive at all to flash photography. They might be surprised by the sound or sudden brightness, but if introduced properly, dogs tend to ignore flashes. And, if they don’t ignore the flash completely, they treat it as a minor annoyance or a point of confusion. Which is why we strongly recommend using flash whenever photographing black dogs or when working with pups in studio. Of course, if your dog does present aggressive or fearful body language when exposed to a flash or strobe or has a history of seizures, stop using it immediately. But those instances are exceptionally rare, even in cases where dogs that are typically terrified by lightning or thunderous storm conditions. As a professional dog photographer I have photographed literally hundreds, if not thousands, of dogs (many of whom were street dogs or recently homed foster dogs) and I have never, literally not a single time seen a flash trigger a dog attack. 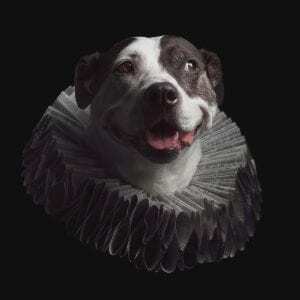 During well over 99% of my canine portrait sessions (including my critically acclaimed creative dog art portrait series, Paper Hats) the dogs were photographed using a flash, strobe or other artificial light source, such as a reflector, without any issues. In the few instances where a dog responded fearfully to a flash or were surprised by a strobe, we are able to quickly bring them back into their comfort zone via a mixture of patience, positive reinforcement, and basic distraction techniques. In fact, I would go so far to say that in my experience dogs are far more likely to be fearful of light stands, tripods or the lens of a camera (which we believe they may confuse with a giant eye) than the flash itself. Why is artificial light important? Here’s the thing about natural light, natural light is great – when it’s great. But more often than not natural light is actually pretty terrible. Natural light more often than not is way too bright, too harsh, far too dim, or coming from an inconvenient direction. When is the best time to photograph a dog without a flash? The Golden Hour refers to the hour before sunset or the hour after dawn, where the angle of the sun creates a soft diffused glow in photographs. Out of the 24 hours in the day, photographers count on just those 2 for consistently great light. And that’s if they’re working outside and the weather cooperates, and then only if their subject and background happens to be facing the proper direction at that time of day. For everything else, photographers most create and shape their own light. There are many ways to generate light but all of these methods fall into one of two distinct categories of light sources – continuous and strobe. Continuous light sources are those that generate persistent and consistent light. LED panels, incandescent lamps, fluorescent ceiling lights, flashlights, even the headlights of a car are all examples of continuous light. The Sun, and by extension virtually all forms of natural light, also are examples of continuous light. Continuous light does have its uses. Continuous light can be seen, which makes it a simple thing to point and shape in the moment. And of course, it is an absolute must for video production. But that isn’t to say it doesn’t have its limitations. Remember how we said that the Sun is a continuous light source? Ever stare at the Sun? How’d that work out for you? All continuous light sources have the same issue. The brighter and more powerful they are the more difficult, even painful, they are to look at. And like the Sun, continuous light sources tend to run hot, though some less than others. So, even if you’re bouncing the light source, chances are a dog is going to look away from your reflector. Which poses a problem as most portraits are focused on lighting the face of their subject. Strobe light sources or strobes are lights that emit powerful but short bursts of light. Mono lights, speedlights, flash packs, and on camera flashes are all examples of strobes. Strobes aren’t great for video. But for all things photography related, flashes and strobes are kind of a miracle. They tend to run cooler than continuous light sources and while they may daze subjects, they’re not perceived as painfully blinding. 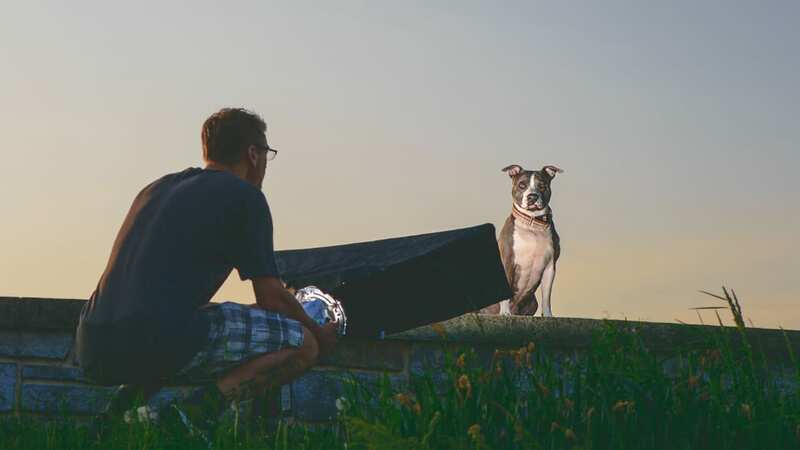 So, while your dog may hesitate to stare at the sun or look in the direction of a high powered persistent LED panel, they’re generally unfazed (albeit occasionally dazed) by strobes or flashes. There are a lot of rumors online about how flashes can trigger dogs or spark aggression. And we can say conclusively that is simply not true. We’ve worked with thousands of dogs, over a hundred different breeds, countless mutts, including street dogs who were recently rescued and even uncollared strays, and not one time has a flash or strobe triggered an aggressive episode or pushed a dog to lash out. At worst, flash surprises dogs and mildly irritates pets – similar to how someone turning a light on while you’re trying to nap is annoying. Now that’s not to say that dogs love having strobes flashed in their faces, but they are a far cry from a behavioral trigger and unlike continuous lights, dogs do not tend to shy or look away from strobes. Strobes, because of their short burst length also have the benefit of creating multiple exposures within a frame. Sometimes you’ll hear photographers reference this as “freezing motion”, in the instance that a moving subject is stopped, while the environment (outside of the flashes influence) is allowed ample time to develop. This method, when applied to still subjects essentially generates an in camera single frame HDR image. When a strobe is set to light an object and a much slower shutter speed is used one is able to capture the best of both of worlds – crisp details on the subject and the vibrant colors and rich blacks that often appear in more shadowy or lower light environments, say during twilight. That’s not to say that strobes don’t have their issues. There are actually two instances in which strobes and flashes tend to fall down. The first stumbling block has to do with shutter speeds. Strobes and flashes depend on timing. As they are exceptionally quick bursts of light, if the strobe’s flash duration is at all slower or faster than the shutter opening and closing it won’t light the frame while the shutter is open. In fact, with most strobes and cameras, at a shutter speed around 1/250 of a second the shutter will actually become visible as it is caught crossing across the frame. In most instances, this isn’t an issue. 1/200 of a second is plenty fast to take photos with relatively steady hands or of still subjects with a tripod. But for action shots or in ultra bright environments that may require faster shutter speeds to help compensate for over exposure, a strobe may not be of much use. UPDATE: many cameras and light manufacturers now support high speed flash. It is not possible to photograph dogs at much higher speeds with relatively inexpensive photography gear. Hooray for technology! Looking to bring out the color of your subject’s eyes? Strobes or flashes may not be your best option. All of the color you are trying to bring out in your dog’s eye (or a human’s for that matter) is contained in the iris. The iris works very similar to the aperture of a lens. In dark environments the iris expands, widening to let more light into the pupil of the eye. In brighter settings the iris contracts, letting in less light. When the iris contracts, more or of it is visible, displaying more eye color. As strobes don’t typically last long enough to influence the contraction of an iris, for eye shots you are usually much better off relying on a continuous light source. In conclusion, there’s nothing to fear from using flash. Using flash is the key to taking creative dog photos. I was would go so far to say that not learning to use and shape artificial light is the #1 thing that holds photographers back and prevents them from consistently take great photos of dogs. So much so, that the ability and competency of flash use is often the most significant factor when comparing the quality and the cost of dog photography from different pet portrait studios. Learn the limitations of flash. Practice using flash to learn how to achieve the best results, both when to use flash and how to shape and modify artificial light. And, use it often. The more often you use flash or strobes around your dog the better they will be conditioned to them being around. Looking for more tips on how to take better dog photos?